She was highly intrigued by the term and wanted to know more about it. So I promised her I would do a post about it. And even though arm party post have been done to death this one is for all those fashion lovers who a still not familiar with the term and concept of an arm party. As trends go, 'Arm Party' is one that did not originate from the runway or red carpet, but in fact is a brain child of a well known fashion blogger who literally started an accessory cult. Now, along with their clothes, bags, shoes the queens and kings of street style have been happily flaunting their bejewelled arms too. What exactly is an ‘Arm Party’? Coined by Leandra Medine of ‘The Man Repeller’, it simply means stacking ones hand with an assortment of bangles and bracelets in one or both arms. For many in India this may not look like a new trend as women here have been adorning their arms with stacks of bangle and bracelet for years. But the beauty of this trend is that it not just restricted to Indian wear, one can now easily wear it with western as well as formal wear. Another reason for its popularity is that this trend has no set rules. Anyone with a variety of bangle/bracelet can pull this trend off with style. With unlimited styling options here are a few of my suggestions. While there is no right or wrong way in stacking an arm party, the key is to balance your pieces out. There has to be a harmony between your stacked bangle/bracelet/watch piece for the final look to be a stylish one. 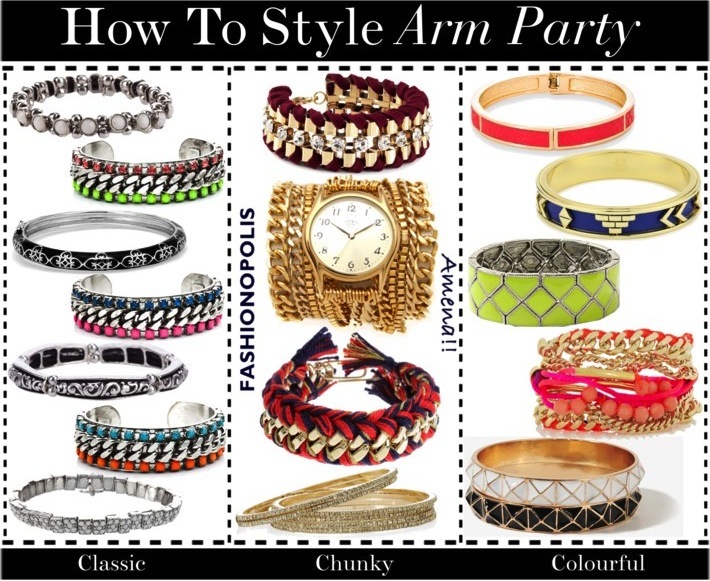 Have you tried creating your very own arm party? And how do you like to stack it? Share your views with me in the comment section. Yay! One of my favorite trends!! Great post, I'm not much of a bangle person but now I'm inspired to try, especially pairing it with the large dial watch! hey terrific way of explaining about arm party~ i'm really impressed! hehe..yeah non fashion people(bloggers or not!!) find some terms out of this world!! 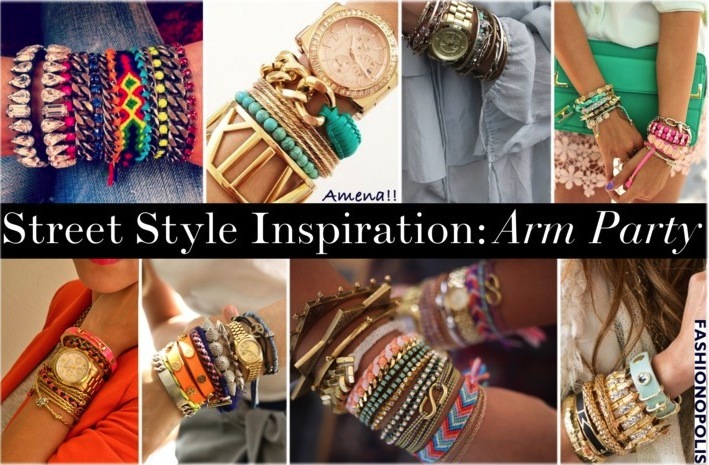 am not a fashion blogger in the strictest sense..but i love looking at arm party pics...but never tried doing it myself!! Indian ladies always cared for arm fashion. Moreover, it goes so well with Indian dress [not that it does not suit western dresses]. Great post as usual! Do you use photoshop for your collages? Your blog looks like a magazine :) and i love it!